Reggae Singer Jimmy Cliff (OM), actor, music innovator, singer, songwriter, music producer, "Activist", and businessman. He started writing and singing from an early age, while he was still attending primary school. It is also said that he is one of the founding father of Reggae Music. In 1962 his father move him to Kingston the capital of Jamaica, so that he could attend Kingston Technical High School. There he sought out many producers while still going to school, trying to get his songs recorded without success at first. But one night he was walking past a record store and restaurant, as they were closing ,he pushed himself in and sang for the Chinese owners of the store and convinced one of them Leslie Kong to go into the recording business starting with Him Jimmy Cliff. The reggae singer Jimmy Cliff second recording with him Hurricane Hattie became a number one hit in Jamaica. He was fourteen (14) years old. He followed that hit with Miss Jamaica, One Eyed Jacks and King of Kings. This led to Leslie Kong becoming King Kong among the producers in Jamaica. Cliff was now very popular on the music scene and in 1964 his first tour came. He was invited and performed at the "World Fair",In the United States. 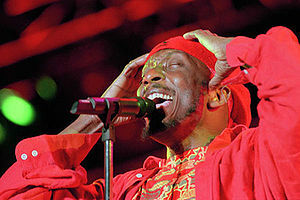 To-date singer Jimmy Cliff has released over twenty-seven (27) ablums. His first ablum is "Hard Road to Travel" released in January 1968. The most recently released is "Existence" released in 2010. * "Come Into My Life"
In 1972, Cliff starred in the (Perry Henzell directed) classic reggae film, "The Harder They Come". The film tells the story of Ivan Martin, a young man without funds who arrives in Kingston from the country, trying to make it in the recording business, but turns to a life of crime and finally dies on the beach in a shoot-out with cops. The soundtrack album of the film was a huge success that sold well across the world, bringing reggae to an international audience for the first time. It remains the most significant film to have come out of Jamaica since independence. On 20th October 2003 he was honored by the government of Jamaica. He was given "The Order Of Merit". This is the nation'sthird highest honor. For his album "Cliff Hanger" which was released in August 1985. He won a grammy for "Best Reggae Album". In September 2009, Cliff was nominated for induction into the Rock and Roll Hall of Fame. On December 15, 2009, Cliff was officially announced as an inductee and was inducted on March 15, 2010. Jimmy Cliff to be named MoBay Community College honorary fellow - Jamaican music icon Dr James “Jimmy Cliff” Chambers is to be named honorary fellow of the Montego Bay Community College during the school's graduation exercise scheduled for the Montego Bay Convention Centre in Rose Hall on Sunday. Exclusive!! Reggae Icon and Rock 'N' Roll famer Jimmy Cliff provides the Soundtrack for Volkswagen 2013 Super Bowl commercial.